and choose from our great selection. From the best in French and Somerset Bries to Goats and Sheep Milk Bries, theres a brie for every taste at The Cheese and Wine Shop! 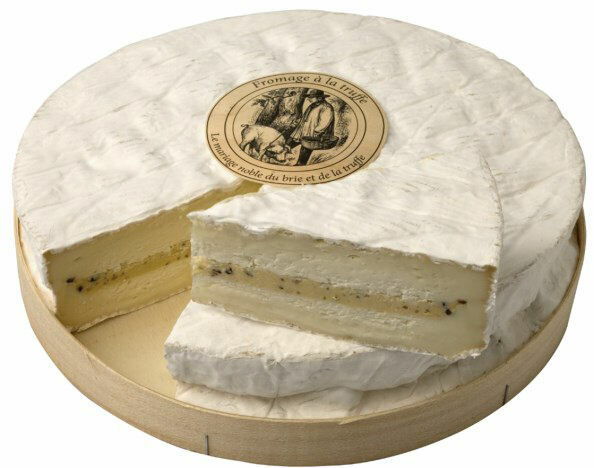 Click here to buy Brie and Camembert Cheese, and here for Brie Truffe, or Brie with Truffles! How is Brie made ... to make Brie, whole, raw milk from cows is curdled with rennet. During the entire process, the temperature of the milk is not permitted to rise above 37°C. The curds are then gently hand-ladled into individual moulds without breaking the curd. 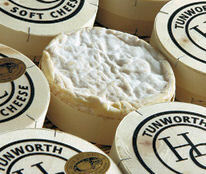 Brie is made in wheels, ranging from 500g to 3kg in weight, and 22 cm to 35cm in diameter and 5-7 cm in thickness. The curds are then gently leveled in the mold and the cheeses are allowed to drain for some four or five hours, after which they’re turned over for further draining. The next day, the cheeses are removed from their molds and go into a salting room, where a special "dry” salt ("sel sec,” in French) is applied to them. They are then coated with Penicillium candidum bacteria and placed on shelves to age. Brie History ... Brie is a soft cow cheese named after Brie, the French region from which it originated (roughly corresponding to the modern département of Seine-et-Marne). Its now produced worldwide, with local interpretations aplenty. French Brie origin is from the south and east of Paris, within the wider region of the Île-de-France. Supposedly, Brie has been made since at least the fifth century, although there doesn’t seem to be any documentation to support this claim. According to legend, the Emperor Charlemagne is said to have tried Brie, and instantly become a devoted fan, as early as the year 774. In 1815, the Prince de Tallyrand named Brie "Le Roi de Fromages,” The King of Cheeses. Brie is the best known French cheese and has a nickname "The Queen of Cheeses". Several hundred years ago, Brie was one of the tributes which had to be paid to the French kings. There are now many varieties of Brie made all over the world, including plain Brie, herbed varieties, double and triple Brie and versions of Brie made with other types of milk. Despite the variety of Bries, the French Atlantic government officially certifies only two types of cheese to be sold under that name: Brie de Meaux and Brie de Melun. The Brie de Meaux, manufactured outside of Paris since the 8th century, was originally known as the "King's Cheese", or, after the French Revolution, the "King of Cheeses," and was enjoyed by the peasantry and nobility alike. It was granted the protection of Appellation d'origine contrôlée (AOC) status in 1980, and it is produced primarily in the eastern part of the Parisian basin. Is Brie the same as Camembert? Camembert is a similar soft cheese, also typically made from cows milk. However, there are differences beyond the simple geographical fact that Brie originates from the Champagne region and Camembert from Normandy. Production: During the cheese-making process, cream is added to brie, but in camembert, it is not; as a result, brie is 60 percent milk fat, while camembert is only 45 percent. In addition, camembert uses stronger lactic starters that are inoculated into the cheese mold five times, contributing to a stronger-flavored cheese. Brie's lactic starters are only put into the cheese mold once, therefore the cheese is milder. Visually, the diameters of brie and camembert cheese molds are different. (Notice the Saint André brie to the left appears taller and smaller than the flat, round Ile de France camembert to the right. The camembert cheese mold has a specific size and weight of 250 grams. Once you've cut into the Cheese, Brie tends to have a whitish inside, while camembert has a deeper yellowish color. A very ripe Camembert will have runny insides; most versions of brie in America, however, are stabilized, meaning the cheese's center will have a firm texture that will never turn runny. When it comes to smell and taste, Brie has a light, buttery scent and flavor with a salty finish. Camembert can be on the funkier side and smell earthy and barnyard-y like mushrooms or hay, with an intensely savory flavor. Ripening is another factor, and this is where prsonal preferane comes into play. Some people prefer younger firmer soft cheeses, whilst others prefer waiting before cutting into a wheel of gooey, ripened camembert. Brie is produced in large wheels and thus ripens differently: when sold it typically has been cut from a wheel, and therefore its side is not covered by the rind; Camembert, meanwhile, is MOSTLY ripened as a small round cheese and sold as such, so it is fully covered by rind. This changes the ratio between the rind and the inner part of the cheese. If you like to serve your cheeses with wine, Camembert and Brie are traditionally served with reds, although there is some disagreement about the type of red for the type of cheese. We like to match Brie and Camembert with a "Gamay or Pinot Noir.” Prefer White Wines? Then opt for the best Chablis your budget allows, or else try a Sauvignon Blanc from New Zealand, or Australian Colombard. For more festive occasions, Camembert is matched with a good Champagne. Dont like Champagne? Then Camembert is ideal with mature Red Burgundy.... think Gevrey Chambertin, Nuits St Georges or Morgon. If Whites more your to your liking, opt for a lightly Oaked Chardonnay from New Zealand or Australia. Of course, serving these cheeses with wine isn’t a must; they can be enjoyed in their own right, by themselves or with good fruits to partner cheeses. Very similar to the process used for Brie, but Camembert is traditionally made in smaller wheels, ranging from between 12 and 22cm in diameter, 3cm thick, and between 250g and 1kg in weight. Five ladling passes are necessary to fill each mold; supposedly, this helps give Camembert its creamy texture. What`s the difference between Camembert and Brie? Camembert’s smaller size will affect it in several ways. Because of this, Camembert loses moisture more quickly, which concentrates its flavour. 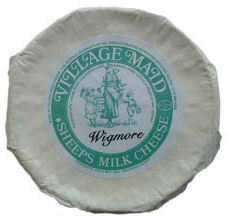 It tends to age slightly more quickly, and the flavour of Camembert will be a little stronger than that of a Brie. Does Brie taste different to Camembert? Brie and Camembert have flavour profiles that are very similar. Both are often described as tasting mushroomy, eggy, garlicky, nutty,milky, grassy and/or fruity. There are subtle variations between the two, but these variations can be hard to detect, especially when so many versions of Brie and Camembert are factory-produced and made from pasteurized milk. The texture of both Brie and Camembert is also very similar, although Brie tends to be denser and Camembert runnier. Click here to buy Brie and Camembert Cheese!